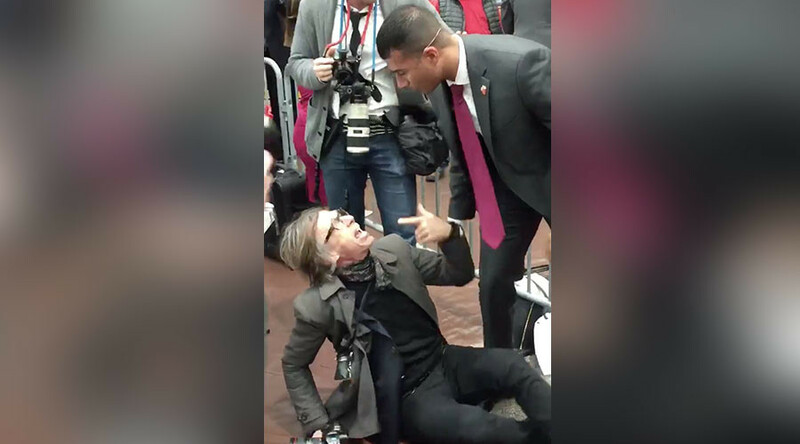 A Secret Service agent pushed a Time magazine photographer to the ground on Monday during a rally for Republican presidential frontrunner Donald Trump. After stepping out of the designated press area at a Trump rally in Radford, Virginia to take photographs of people protesting the event, Christopher Morris of Time got into an altercation with a Secret Service agent. The dispute turned violent when Morris bumped up against and said “f*ck you” to the agent, who then grabbed the photographer by the neck and slammed him onto the nearby table. After getting up, Morris can be seen putting his hand on the agent’s neck, which he said was a demonstration to show what had been done to him. "I said 'he choked me,' so I put hand on him and that's when I was arrested," he told reporters while being escorted out of the event. Morris said he would not press criminal charges against the agent, according to Vice News. A statement from the Trump campaign directed reporters to ask questions to law enforcement, saying that they are not aware of "all details surrounding the incident." The scuffle came amid repeated disruptions of the rally by pro-immigration protesters and Black Lives Matter activists. Trump himself took the incidents in stride, saying "isn't it fun being at a Trump rally?" as groups of protesters were ejected from the premises. The Secret Service released a statement on the altercation, saying that they are working to determine the details of the incident.